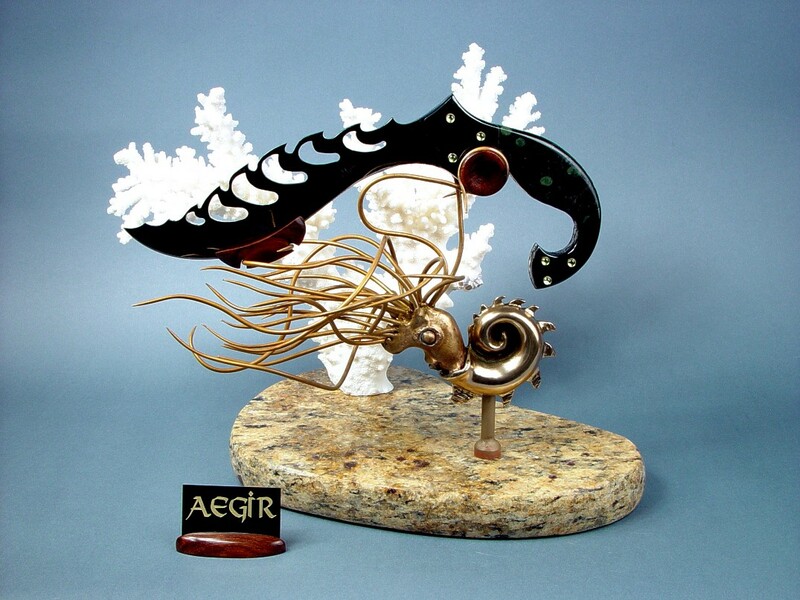 This page is from the web site of the World's Premier Knife maker of Exquisite Gemstone knife handles...Jay Fisher, "The best living Knife maker"
From the moment I saw this gemstone, I was smitten. I had to have some for a very special knife. Ron and Karen Nurnberg were kind enough to supply me with some small Nebula Stone slabs for a very special knife handle. I can't wait to use it. 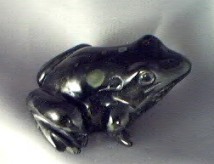 They are the discoverers and original suppliers of this gemstone, making it very special indeed. 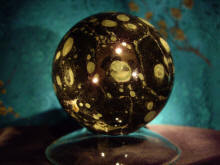 The stone looks like translucent, glowing, green nebulas floating in a sea of inky black space. I've never seen anything like it, and it's a totally new discovery! Read the details of the discovery here. 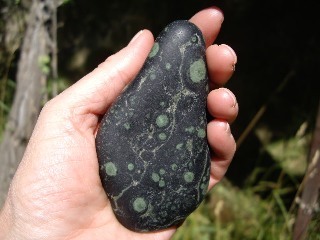 This is the stone that the Smithsonian Institute first said was a new variety of Nephrite Jade, but then admitted they did not know what it was. The American Museum of Natural History claimed that "it's unlike anything any of us have ever seen!" 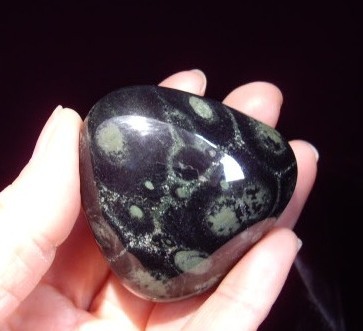 Here is a link to the page explaining the difference between Kambaba Jasper and Nebula Stone. 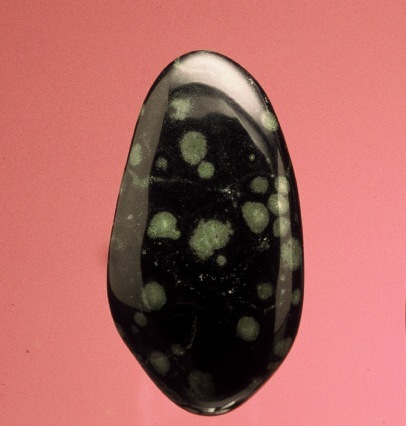 Riebeckite Silicate of sodium and iron (amphibole group) dark blue-black vitreous (glassy) silky in crocidolite variety Named for Emil Riebeck, German explorer and mineralogist. 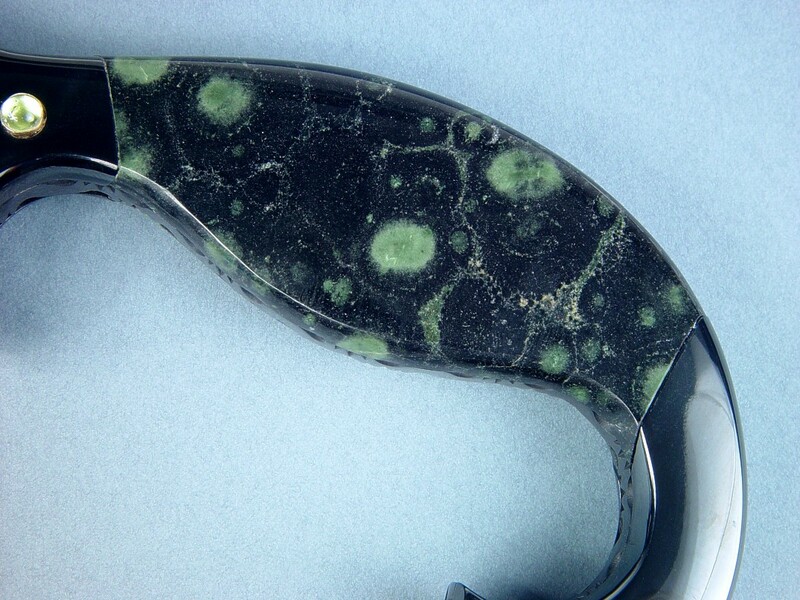 I've used the crocidolite variation in several projects, to see a beautiful gemstone handled Chef's' Set. Zircon Zirconium silicate Black, green, transparent, vitreous (glassy) hard Named from the Persian zargun, "gold-colored"
Quartz Silicon dioxide Lustrous, glassy, some in gem quality, all colors Named from German quartz, meaning "uncertain origin"
The breakdown of the mineralogy of this gemstone does not describe how these minerals combine to form this truly unique gemstone. 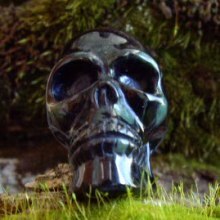 This is some breathtaking and truly unique material that will make a stunning knife handle. Stay tuned for the result! 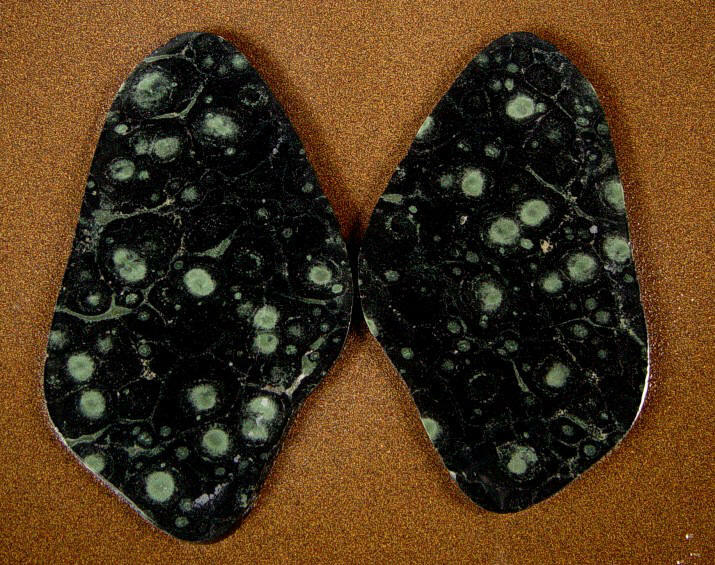 Using Nebula Stone scales (Gemstone knife handle slices). Back to Carvings page BACK TO HOME PAGE Link to Jay Fisher's Website Be sure and tell Jay that Ron and Karen sent you!